Why I read this book: It has (a fictionalized version of) Glenn Gould in it. Three men study together under Horowitz in their youth - One of them, a Canadian named Glenn Gould, ascends to the highest level of talent and fame. Another leaves the world of music, ostensibly with no regrets. 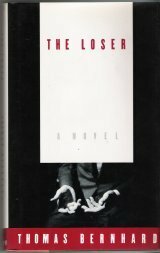 The third, having firmly believed in his own virtuosity and potential until hearing Gould play, falls apart; he is the eponymous loser of the novel. If it can be described at all, The Loser is a rambling treatise about how their time together as friends went on to colour the rest of their lives. One of the things that intrigued me about this book is that it had been described to me as consisting of one long, run-on paragraph. Just to clear things up: As it turns out, there are actually a grand total of four paragraphs throughout the entire length of the novel, although all four of them start on the first page. So yes- while this edition has a font that is reasonably sized and margins that are relatively wide, it does in fact mostly consist of a 150-page monologue. That said, the slight trepidation I felt upon flipping through the pages and not finding any paragraph indentations was ultimately allayed, because this monstrous passage is not remotely as unreadable as it might have been. The stream-of-consciousness style certainly helps: It feels conversational rather than impenetrably Joycean and dense, and the whole effect is similar to having a slightly drunk stranger regale you about his life in a tavern somewhere - as, I suppose, it may well have been intended to be. There is a downside to the monologue style of the prose, unfortunately: Our drunk stranger in question tends to get repetitive and long-winded, repeating the same ideas again and again and again (etc.). There is no doubt that the cyclical pattern of the narrative is intentional - perhaps for the purposes of mirroring the variations on a basic theme that are woven through a piece of music - so I certainly can't fault Bernhard for not having crafted his piece with such detail. As it is, as engaged as I was by the conversational monologue of his narrative at the beginning, after reading for the umpteenth time that the titular "loser" in question fell apart "because of Glenn", I started to almost feel physically tired just looking at that same phrase again. With that in mind, I'm giving The Loser 4 stars for the finesse with which it took me on its rambling journey. Beautiful review. Bernhard is very funny, indeed. But the translation of the title is strange, although funny too. The German word is "Untergeher", something like "the one who is going under".